Hurry up: Audiffex's STA Phaser plugin has been free for a while now, but after May 2016 ends it no longer will be. This week again, MeldaProduction offer 5 plugins at 50% off. Like every Monday, MeldaProduction has picked five of its plugins that will be available at half-price until the end of the week. 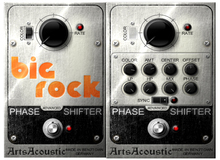 This week, you can download the phaser from the Audified STA Effects bundle for free. When a German web designer develops free audio plug-ins for Mac and PC, we at Audiofanzine have to check this out. The new creation from Synapse Audio is an emulation of a famous phaser from the 70s in Rack Extension format for Reason 7. B.Serrano unveils a new series of audio processors that currently features 5 free VST effects for Windows.